When your dog takes a mouthful of food and moves away from his bowl, even as far away as another room, you have no cause for alarm. Although it may seem odd, it's usually just a dog's instinctual way of making sure he gets enough to eat. When puppies are in the litter, they engage in shoving matches to get to their mother's milk. Some owners feed puppies from a communal bowl, which can lead to more shoving. In such cases, smaller, less aggressive puppies might be forced to grab and run, filling their mouths with food and moving away from the bowl with it. They then dump the food so they can take manageable bites without the fear of another puppy swiping it. WOOF: Why Is My Dog Leaving Food All Over The Floor? This same behavior takes place among wild adult canines, who separate themselves from the pack to keep others from snatching their food. At some point in life, your dog may have felt his meal was threatened and so he instinctively runs away with a mouthful of food only to come back for another and another. Believe it or not, some pooches are so sensitive to noise that an unpleasant sound made while he eats from his bowl may be the culprit. For example, the bowl might be rattling as he scoots it across the floor, or his tags could be hitting it as he dips his head in. This is especially a problem with metal bowls. He'll still want to eat, but not likely out of that bowl. 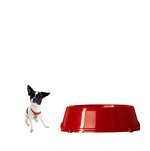 If your dog doesn't seem upset by moving his food, there's no reason to worry -- he's going to get enough to eat, just not in a traditional fashion. If his dropping the food bothers you, you can change his behavior. If bowl noise is the problem, try feeding him on a paper plate. Otherwise, feed him in his crate or in a closed room, giving him his privacy so he doesn't need to worry about food thieves. Eating away from the bowl might not be a problem. But when your dog becomes aggressive about it, you might need some help from an animal behaviorist. When a dog starts guarding his food, he can quickly go from loving pooch to fearsome wolf. Warning signs include growling, snapping or charging toward you. Instead of risking a bite, call in a professional to help you change his behavior. Do Dogs Whine When They're Bored?